I'm taking advantage of the last few cold days to wear as many of my favourite wool knits as possible. This stripy sweater has been in my closet for many years now and even though I don't wear it very frequently, it's still one of my most loved ones. 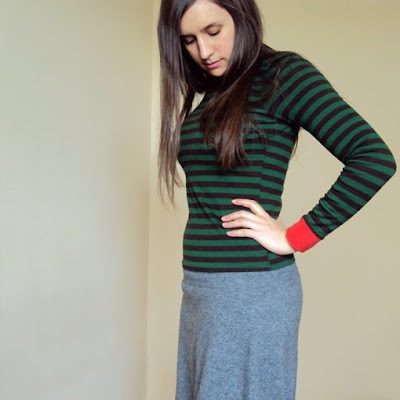 And that skirt, well, you've already seen it a lot here on the blog. During 2009 I wore it on January, March and December, and it's also the skirt I wore on my Streetgeist photo, on February of the same year. I'm gonna miss those staples, but spring is here and that can't be a bad thing! BTW, I trimmed my own hair last night (I always cut my own hair, I have a phobia of salons and hairdressers) and straightened it this morning. Feels weird to wear my hair down for once and I can't stop playing with it. 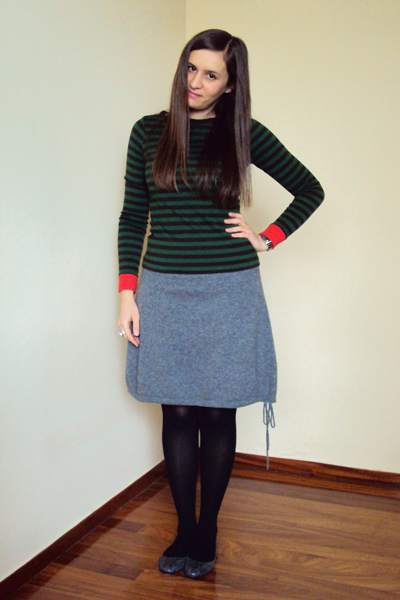 Stripy wool sweater and grey wool skirt, Benetton. Grey snakeskin flats, Massimo Dutti. Two-finger bow ring, Erica Anenberg. Salons always make e nervous. and neurotic. always. poli oraio to pouloveraki! ki ego pistevo oti einai muthos oti oi gunaikes diaskedazoun sto komotirio! to xeirotero mou ekei einai to lousimo! Ο συνδυασμός χρωμάτων σε αυτή τη μπλούζα είναι φανταστικός! μου αρέσουν πολύ οι ρίγες! stripes are so you. i like. i really like your hair down! and i am doing the same thing at the moment...layering things....i think i am going to miss cold! as for hairdressers, i enjoy my appointment once a month. like the girls said above you need to find someone who doesn't want to cut off all your hair and doesn't gossip much. but i agree with anastasia, the way they do the washing part is a mini torture! 3 words! : simple, comfy and amazing! I wish I had the guts to cut my own hair because I hate hairdressers as well. Lopi mou, eida simera mia foustitsa sta Pull and Bear kai skeftika esena, einai tulip stil, se mov-lila kai se mpez nomizo. Den ti dokimasa alla mou arese poli kai 8a pao avrio. You are such a doll! The stripes look great on you!! How cold would you say it still was? I'm going to be in Athens in a few days, and I'm hoping I packed the right clothing.